Why go somewhere over the rainbow when you can just hang out inside of it? Kampung Pelangi, a small village in Indonesia, has transformed itself into a stunning display of bright colours and whimsical designs, a huge departure from its former state of squalor. 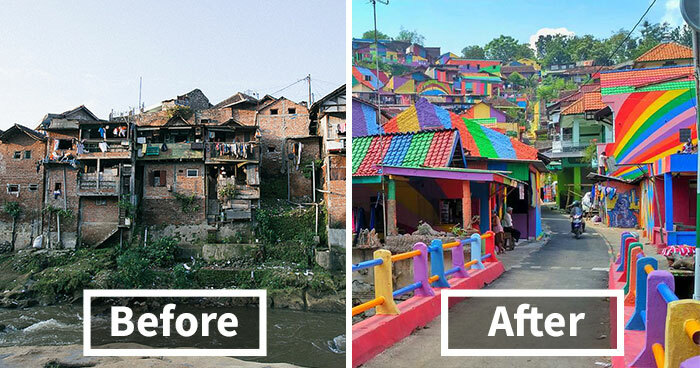 The Central Java community, located in a southern district of Semarang, spent over $22k on the magnificent makeover in a bid to shake off its status as a degraded slum. Initiated by 54-year-old junior high principal Slamet Widodo, the project was inspired by at least 3 other towns in the country that adopted similar paint jobs, and has turned at least 232 homes in Kampung Pelangi into works of art. Creative murals adorning the walls of narrow passageways burst with life, giving a veritable pulse to the whole village. Tourists have definitely taken early notice of Indonesia’s growing rainbow village trend, and have flocked to them accordingly, including Kampung Pelangi. The investments made in revamping the former slum are sure to pay off, as local businesses are already seeing a rise in souvenir and food sales, according to the Indonesian Builders Association. It goes without saying that the lively, bohemian atmosphere of this newfound hot spot is also gold for Instagram shots!